PARIS — Tens of thousands of European travellers were stranded Sunday in rail stations, traffic jams and airports as heavy snow and ice caused massive disruption at the start of the Christmas holiday season. Temperatures in parts of Germany fell to below minus 33 degrees Celsius overnight, as parts of Western and Northern Europe from Portugal in the south to Poland in the east were hit by heavy snowfall. In Eastern Europe, snow as deep as 2.5 meters has been reported, while temperatures in Mediterranean regions such as Spain dropped to around minus 20 degrees overnight. LONDON — Eurostar suspended all its rail links between London, Paris and Brussels on Sunday as cold weather caused chaos on the high-speed passenger line for a third day, with no relief in sight. WASHINGTON (AFP) – A ferocious snow storm blanketed much of the eastern United States Sunday, cutting power to hundreds of thousands of homes, paralyzing air traffic and stranding motorists. The governors of Virginia, Maryland, West Virginia and Delaware declared states of emergency in advance of the storm, the worst to hit the region in decades. Three people died on Virginia roads Saturday as some 3,000 accidents shut down interstates for several hours, according to the state’s department of emergency management. The Virginia Department of Health confirmed one other weather-related death. Hundreds of thousands of customers lost power in West Virginia, Tennessee, Kentucky, Virginia and North Carolina. The worst of the storm was over for Washington as it swept northeastward, but a lot of roads were still unplowed in the city unused to so much snow so early in the year. Only scattered flurries remained after snowfall shattered a 1932 December snowfall record, with 16 inches (40 centimeters) covering streets and homes. It was also one of the biggest snowstorms to hit the capital since records began in 1885. Service slowly returned to the capital region’s main airports after hundreds of flights were cancelled Saturday, stranding thousands of passengers on one of the busiest travel weekends of the year. Washington Dulles International Airport reopened one of its four runways. Snow-clearing crews were still busy on the airfield there and at Reagan National Airport, where runways were expected to reopen around 10:00 am (1500 GMT), Metropolitan Washington Airports Authority spokeswoman Tara Hamilton told AFP. Baltimore Washington International Airport also resumed air traffic, although many flights were delayed or cancelled. But bus service remained suspended and limited Metrorail operations saw trains servicing only underground stations at 30-minute intervals. Heavy-duty diesel-powered trains moved back and forth throughout the night along exposed, above-ground sections of the track to clear and de-ice them. “For now, the responsible decision is to limit service until conditions are safe for our customers and employees,” said Metro general manager John Catoe, adding that officials would reevaluate conditions later in the day in hopes of resuming halted service. The massive storm at one point stretched some 500 miles (800 kilometers) across a dozen states, affecting around a quarter of the US population. Much of the East Coast, home to tens of millions of Americans, turned into a winter wonderland, even if the conditions were as perilous as they were scenic. The monster weather system was moving steadily northeastward, blanketing Baltimore with roughly 20 inches (51 cm), Philadelphia (23 inches, 58 cm) and New York, where the National Weather Service (NWS) forecast near-blizzard conditions and as much as 14 inches (36 cm) of accumulation before the snow tapers off later Sunday. Further north, Boston was facing a similar fate, with blizzard warnings in effect for parts of Massachusetts, New York and Rhode Island. Some parts of Virginia received more than two feet of snow. Areas in Maryland recorded 23 inches (58 cm). Officials reported many Virginia drivers and passengers had been stranded in their vehicles, some for more than 12 hours. Emergency services delivered hot meals and 400 bottles of water for stranded motorists, while others were moved to shelters. Greyhound Lines, the country’s biggest provider of bus transportation, canceled service on nearly 300 routes across the eastern seaboard. 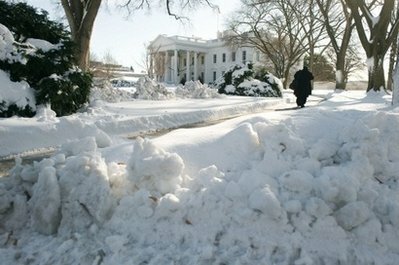 President Barack Obama raced home from a climate change summit in Copenhagen to avoid the worst of the storm that hammered the East Coast with over two feet (61 cm) of snow in some places. He got back before dawn on Saturday, two days before winter’s official arrival. The major shopping day usually accounts for some 15 billion dollars of all nationwide sales on the last weekend before Christmas. Most churches and other places of worship were closed, along with museums and schools. And snow could return to the capital as early as next week, with NWS meteorologists forecasting more flurries on Christmas Eve and Christmas Day.